If you want to give your kitchen a makeover or you’re designing a brand new kitchen, then you’ll be well aware that picking the right materials in exactly the right colours for your new worktops and cabinets is crucial. This can sound like a daunting prospect but if you keep a few simple guidelines in mind in the initial planing stages, and also make use of a free kitchen planner online, then your latest features will really add new life to your room. The final decision as to the colour of your worktops and fittings will greatly depend upon the colour scheme of your walls and flooring. If you have brightly coloured walls with rich, bold tones, then selecting a contrasting natural style of cabinet and work surface can bring those vibrant colours out even more. Alternatively, if you have light natural colours on your walls then strong, bright reds and oranges can work perfectly if you’re looking to introduce a modern and sharp look to your cabinets. When it comes to selecting materials, there are three main categories that you can choose from, each with their own strengths and weaknesses. 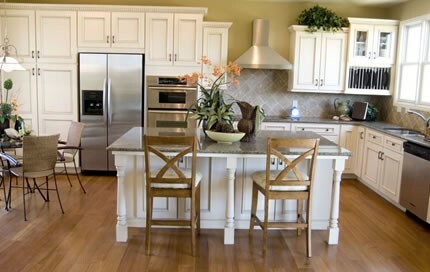 Wooden surfaces are good for those designing cheap kitchens as they are the least expensive and most environmentally friendly option and look great in both traditional and modern kitchens. The advantage of a wooden surface is its versatility as there are thousands of different stains and paints that can bring out the best of this material. Wood’s downside, though, is that scratches and chips are difficult to avoid, which is not a problem for the next material. Stone surfaces, like granite, are very durable. They also look stunning and are practical as a work surface. They come in various colours and styles and will give your kitchen a look that you cannot achieve with any other material. The downside to this excellent material is the cost but it will add to the value of your kitchen if you’re looking to sell in the future. Finally, metallic surfaces such as stainless steel look great for both worktops and cabinets. They are durable and also easy to clean, which is good because the downside is that you might have to do a lot of it! Stainless steel shows up dirt and finger marks like no other surface, so that is the sacrifice you have to make for your impressive metallic surfaces. Whatever colours and materials you select, there will be pros and cons to each, so choose a style that you love so much that the cons don’t feel so bad.